The remnants of a 5th century BCE temple rise at the southernmost tip of the Attica peninsula south of Athens. 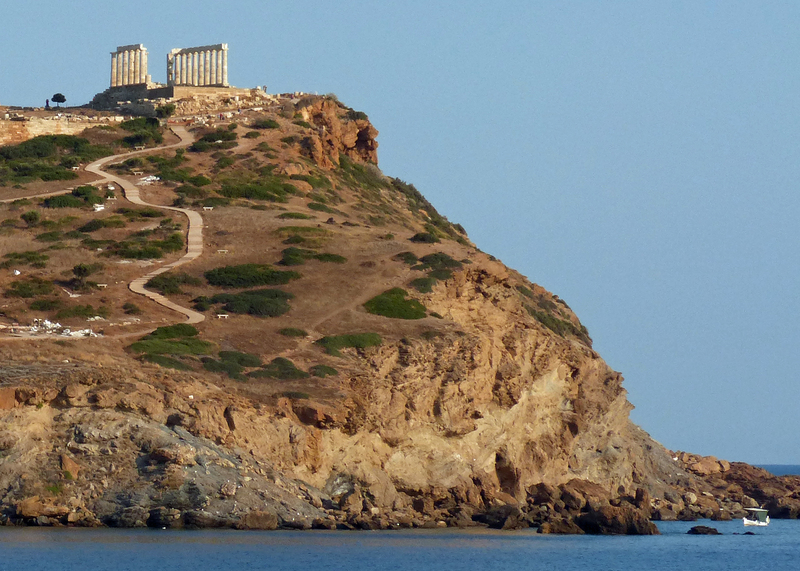 This temple was dedicated to the god Poseidon, and it’s located on a cape called Sounion. Our excellent tour planner arranged a late afternoon ride there for us. Our ride of about an hour in each direction featured a terrific lunch in a seaside café on the ride south and beautiful sunset views on the return trip. Homer made the earliest reference to Sounion in his account of the struggle between Odysseus and the Cyclops (who was a son of Poseidon). Odysseus made the mistake of boasting to the Cyclops that it was he who had blinded the one-eyed giant, leading to Poseidon’s punishment, the ten-year ordeal of Odysseus’ journey home. The temple at Sounion was probably built in ca. 440 BC and originally included 34 columns. Today 15 columns remain, making an impressive appearance on a promontory 200 feet above the sea. For 25 centuries people have traveled to this temple and to Sounion. In the days of ancient Greece they came to pray to Poseidon and to defend the sea entrance to Athens. Fortresses were built here and battles were waged. More recent visitors come to admire the view and the remains of the temple. Lord Byron boldly carved his name in the stone of the façade. Sounion is about 40 miles south of Athens. It would be a terrific ending to a day spent on the beaches found along the route south. If you come, plan to be here at sunset for the very best views. On the first day of summer, the sun sets exactly in the middle of the caldera of the island of Patroklou, the extinct volcano that lies offshore. Go to Google Images and do a search for “Sounion” to see many beautiful photographs. This entry was posted in Greece by Libbie Griffin. Bookmark the permalink.